With publication of The Legacy of Tracy J. Putnam and H. Houston Merritt: Modern Neurology in the United States, Lewis P. Rowland has produced both a valuable addition to the history of neurology and a scholarly, entertaining and highly readable work. The general narrative of this book contrasts Tracy J. Putnam and H. Houston Merritt’s discovery of the anticonvulsant drug “Dilantin” with a wider analysis of the institutionalization of twentieth-century American neurology. In so doing, Rowland’s book provides details about interwar neurology at the Boston City Hospital, Massachusetts General Hospital, and the New York Neurological Institute, three of the most significant centers for neurology in interwar and post-war North America. Putnam and Merritt warrant this close attention. So too does Rowland’s broader theme, the development of neurology, a topic that has been given short shrift in the secondary literature on the history of psychiatry, psychology, and neuroscience. Tracy J. Putnam (1894-1975) was born in Boston, Massachusetts. The son of a physician and descended from a family that could trace its lineage back to the Revolutionary War era. Rowland describes Putnam as a Bostonian Brahmin. Putnam’s choice of career likely derived from influences in his father’s generation. In 1873, Harvard University Medical School had appointed his uncle, James Jackson Putnam (1846-1918), lecturer on the application of electricity in nervous disease, and he had subsequently became professor of the diseases of nervous system there in 1893. James Jackson Putnam had retired by the time Tracy Putnam completed his undergraduate degree at Harvard, and he was deceased by the time his nephew completed his medical degree at the medical school. From Harvard, Putnam trained in pathology at Johns Hopkins (1920-21), held a surgery residency at Massachusetts General Hospital until 1923, and then studied neurosurgery with Harvey Cushing at the Peter Bent Brigham Hospital until 1924. Following a wanderjahr in Amsterdam with Bernard Brouwer in 1925, Putnam joined Stanley Cobb’s neurology unit at the Boston City Hospital, where he developed a joint expertise in neurosurgery and neurology. 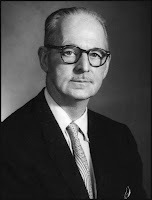 When Cobb moved in 1934 to become head of psychiatry at the Massachusetts General Hospital, the Faculty at Boston City Hospital appointed Putnam chief of Neurology. Perhaps attracted by the larger neurology service there, Putnam moved to the New York Neurological Institute in 1939, where he became Director of Neurosurgery and Neurology at the Institute and Professor of Neurology in Columbia Medical School. For reasons likely related to his principled stand against institutionalized anti-Semitism, Putnam found himself ousted from his Directorship by 1947. He spent the remainder of his days practicing in Los Angeles, where he became interested in multiple sclerosis. Rowland produces substantial evidence that Putnam died deeply embittered by the way he was treated in New York, and that treatment was likely the reason for his distinct coldness towards H. Houston Merritt, his one time “faithful Chef de Clinique” and replacement at Columbia (p. 9). Hiram Houston Merritt (1902-1979) contrasted in every way from his collaborator. Born in Wilmington North Carolina of Methodist stock, Merritt’s father was manager for a local railroad company. A brilliant student, Merritt had attended the University of North Carolina, transferred to Vanderbilt University, where he completed his undergraduate work, and by 1926, at the age of 24, had completed medical school at Johns Hopkins. Following an internship at Yale, Merritt moved to the Boston City Hospital. He spent time in Munich, studying under Walther Spielmeyer, and then the Harvard faculty appointed him in 1931, where he eventually becoming full professor. Throughout the 1930s, Merritt retained his appointment at the Boston City Hospital. There he and Putnam began their collaborative research on anticonvulsants around 1935, and when Putnam left for New York; Merritt became the interim director of the neurology unit, and would have become director had they not hired Derek Denny-Brown (1901-1981). Merritt joined Columbia Medical School in 1944, and after Putnam’s unceremonious removal, became Director of the Neurology department. He remained there until 1970. Merritt’s textbook of neurology, rivaled in America only by Raymond Adams’, was widely adopted and is now in its twelfth edition. Merritt and Putnam began collaborating sometime in 1935, and they published seven papers together between 1937 and 1941. Bromides and Phenobarbital were then the only treatments available for epilepsy, and both had unpleasant hypnotic side-effects. Merritt and Putnam’s research thus had the simple goal of alleviating the side-effects while increasing anticonvulsant activity. Using an animal model of epilepsy, and examining 19 chemicals structurally similar to Phenobarbital and provided by the company Parke-Davis, Putnam and Merritt were able to demonstrate that the palliative properties of Phenobarbital could be separated from the hypnotic effects. In their second paper, they reported that the most active substance – Phenytoin – appeared highly anticonvulsant and less hypnotic that Phenobarbital. They were subsequently able to demonstrate similar effects in epileptic patients, and “Dilantin” soon became the best antiepileptic available in the market, and in many respects contributed to a broader shift in the ethos underlying drug development. And that, of course, is the larger story absent from Rowland’s otherwise outstanding effort to tell this story. As many histories built ultimately on biographical foundations, Rowland’s generally wonderful work is uneven in some places and struggles whenever issues and questions about context arise. His analysis of anti-Semitism, for instance, is strikingly pragmatic and largely avoids delving too deeply into the substantial secondary literature now available on this topic. On the evidently less controversial history of drug development and standardization, Rowland’s book comes up equally short. Though hardly detrimental to the quality of his story, I nevertheless found myself regretting such lapses, especially the lack of attention to the history of drug development. Without an awareness of that history, the reader cannot fully appreciate the significance of Merritt and Putnam’s achievement for neurology. Among the more significant and generally under-appreciated discoveries of the industrial revolution in the nineteenth century were natural and synthetic dyes that could selectively color biological tissues. These dyes, which were initially used to produce a wider array of colors in silk, cotton, and wool goods, were soon found useful in histological research, because they would selective bind to some tissues but not others. The implications of this observation was that chemicals existed that could be targeted to specific organ systems. Moreover, some of those chemicals might even possess therapeutic benefits. With the further development of a model of cellular membrane chemistry (derived largely from Paul Ehrlich’s Nobel Prize winning research on side-chain theory and his work on Salvarsan), many clinical researchers began attempting to isolate and purify the biologically active components of these larger compounds. Simultaneously, purification and examination of bodily products like hormones and enzymes had also begun, most famously in the Nobel Prize winning research on insulin conducted by Frederick Banting and Charles Best in the early 1920s. Pharmaceutical companies like Pfizer, Burroughs-Wellcome, Lilly and Company, and Parke-Davis were at the forefront of these developments. Putnam and Merritt’s separation of therapeutic properties and side-effects was an important demonstration of the multiple types of biological activity possessed by large compounds. But their research was significant beyond that demonstration. Their work indicated that the psychical and organic effects of compounds might be distinct, a finding with profound meaning for neurology and psychiatry. The implications were two-fold: firstly, clinical research could remove the nasty side-effects of some drugs without jeopardizing their curative properties. Secondly, certain chemicals could be isolated precisely for their psychical properties. In addition to these demonstrations, Putnam and Merritt’s work was, as Rowland does note, also among the first studies to apply “basic science results in laboratory animals to disease in humans” (p. 11). In sum, Putnam and Merritt’s work, much in harmony with the times, rooted neurological treatment in a new clinical configuration and thus aided-and-abetted the subsequent rise of psychotropic drugs like chlorpromazine, which was also first discovered in the 1930s. Even if this more subtle historical picture is missing from Rowland’s history of modern neurology in the United States, his book nevertheless remains important and useful. It represents one of a few works that have ventured into the almost completely neglected terrain of American neurology in the interwar and post-war period. It is a “must-have” for the historian of modern neurology and will be an equally useful book for those historians of medicine interested in the rise of the modern pharmaceutical industry. As a case-study, the work may also be useful for undergraduate teaching, since it addresses multiple salient issues in the history of medicine. Sounds like a facinating book.